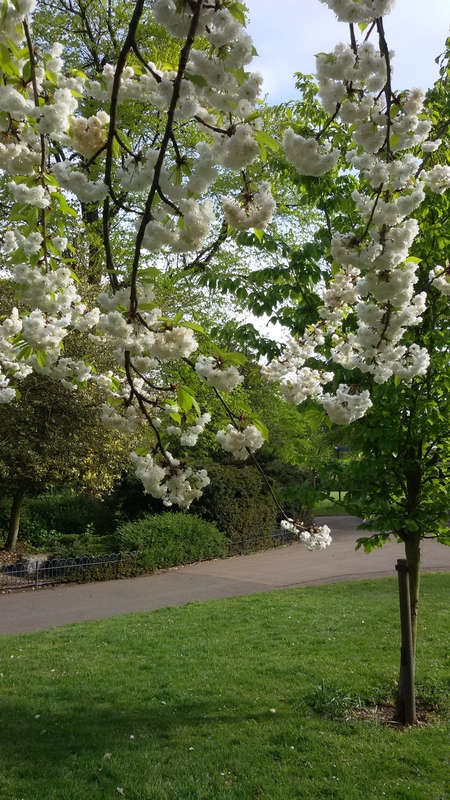 The blossom in Victoria Park was spectacular this morning. Over the past two days I have grown to love this park. I didn’t know it existed before mooring up a couple of days ago in the only available space on the towpath as rain thundered down on my hat. Thanks to Lottery Funding, and a lot of community work, Victoria Park has become the heartland of Tower Hamlets, an area that is considered as one of the world’s most racially diverse zones, with one of the highest proportion of Muslims in England. Therefore, I imagined I would have felt some kind of tension. Yet, I experienced the park as an oasis of calm and tranquility; an inspiration to a myriad of runners, cyclists, walkers, roller-skaters, mums with prams, children, dogwalkers and cricketers. People from every creed and colour mingle here to enjoy what this green space has to offer and to take care of it. It felt to me, as I walked around it yesterday evening, that Victoria Park is a symbol of hope. Perhaps this is indeed, the great big melting pot that Blue Mink sang about in the late sixties. The boat people on the towpath were lovely too. Lots of youngsters are now living on the canals as an alternative life choice to bricks and mortar they can’t afford, or living with their mums and dads. I was amazed how kind and helpful they were, and how young the chap was who came to borrow my hosepipe because his had slit. 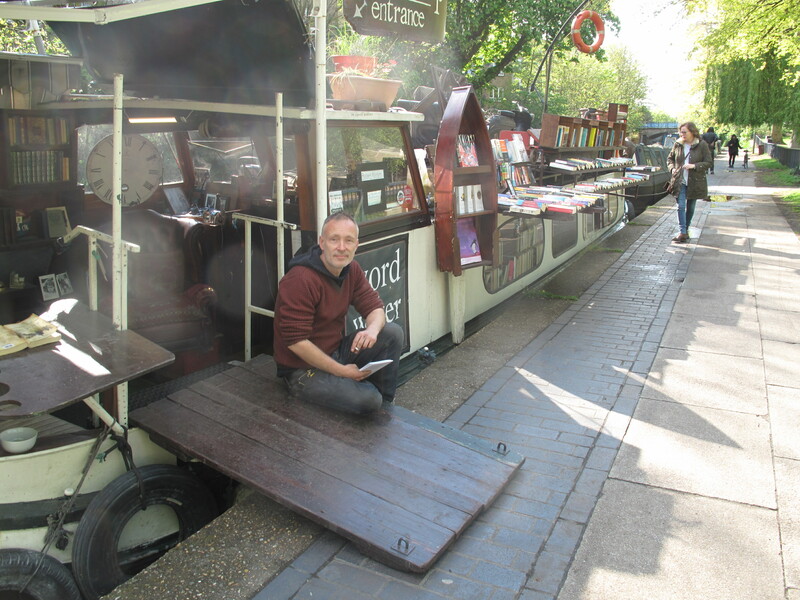 Two boats up, the beleaguered Words on Water – a fabulous book boat, owned by three boaters – seemed to be doing good trade in second hand paper backs. That’s the fate of all continual cruisers (those who live aboard – or liveaboards as they are known – that don’t have a permanent mooring or belong to a marina). You are given two weeks grace, and then you have to move to a different area to find a new mooring. This makes living on the canals, but working on land (and even water) insanely difficult. It’s also very difficult for the increasing number of water-born children to get to school. Yet I can see where the Canal and River Trust is coming from. It’s trying to cut down on those who take advantage of prime moorings, especially in London. 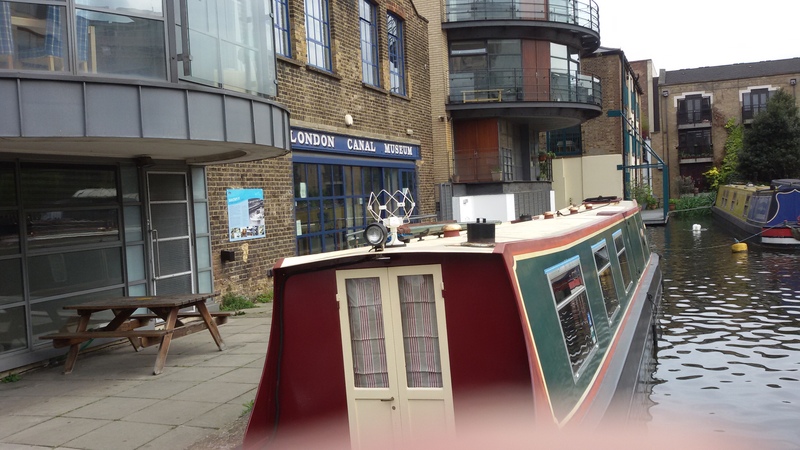 So it was with some sadness that I set off this morning for the London Canal Museum, located in Battlebridge Marina, near Kings Cross. I had rung Martin, who runs the museum, a few days ago to explain about the pop-up death cafes in hope that he could give me a mooring for them. For various reasons, he couldn’t. But out of the kindness of his heart and enthusiasm for the pop-up death cafe concept, he offered me a space for three nights. Fortuitously, the tug that is usually moored there was taking part in the annual Regent’s Canal cavalcade (a riotous boating festival) and wouldn’t be back until Monday afternoon. I came up the first lock with a delightful couple around my age who were both ordained ministers and permanently lived on their sixty foot canal boat. I never learnt their names, but the wife was astonished to see me on my own. ‘You’re very unusual, you know,’ she said as she borrowed my boat hook to yank out one of their fallen buoys from the lock. ‘We seldom meet people of our age doing this.’ I didn’t know if that was a complement or a warning. Arriving at the second lock, I met up with another boat that was heading for the cavalcade. The owner does it every year without fail, so the boat was full of people willing and able to open and close extremely heavy gates. Heaven for a single-hander as I am these days. I tried not to mind, but going through a tunnel that is dark as mud without a light at the front to show the way isn’t much fun. But I managed, and waved the boat farewell as I drew into the side near the turning to Battlebridge marina and the London Canal Museum. I was a bit early, so I thought I would moor up for an hour in a place, I grant you, that was illegal. I reached down to the button that turns the engine off. Nothing happened. I punched the button several times. Still nothing happened. I turned the key to the off position. The engine kept humming. I turned off the isolator that normally does the trick. Again nothing happened. ‘My engine won’t turn off,’ I said to her. By now I was hitting the automatic dial number for John, a hundred or so miles away in Bradford on Avon, who I knew would be able to tell me what to do. ‘You have to move or I shall report you to the Canal and River Trust,’ repeated the woman as I explained to John what was, or wasn’t happening to the engine. ‘Please go away,’ I said to her, as John talked me through all the possible scenarios that could turn the engine off. Nothing worked. The woman kept on at me, until I said very forcefully. ‘PLEASE GO AWAY.’ The message that I wasn’t pulling a fast one must have finally sank in because she and her camera disappeared. In the meantime, John had drawn a blank. ‘Not sure what to suggest, really’, he said in his lilting Bristolian accent. Normally, in times of breakdown, it soothes me. Now it made me feel alarmed. 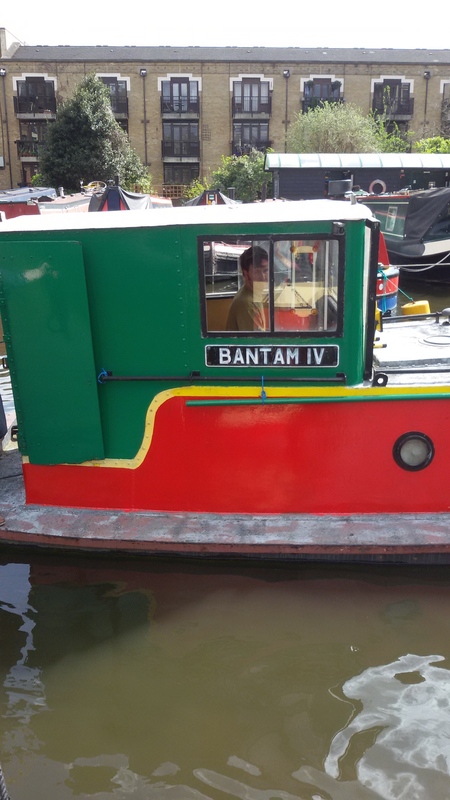 A narrowboat engine that won’t turn off is not what anyone wants on their hands. It’s not a very big space, so turning is a bit of hazard especially as the tug boat was still in situ and there was another boat moored right outside the museum. ‘Press the emergency button,’ they said in unison. ‘I don’t know what you mean,’ I replied trying not to hit the boat moored in front of the museum. Well, I thought, this is a helpful conversation. Various men, including Martin from the museum, began to signaling to me what to do, and where to go. I am particularly grateful to the man whose boat I was about to hit, grabbing my bowline and dragging Mystic Moon in beside him, engine happily running. I explained my problem. He and another boater climbed onto the back of Mystic Moon to have a look. And then an angel appeared in the guise of the tug-boat driver. A young man who pushed his way through the crowd, pulled up the flooring that covers the engine and found the lever that turned it off. ‘It looks like the spring has gone,’ he said. I tell you, if I had been a younger woman he wouldn’t have got away. But a thirty-five year age gap is a bit excessive in any situation. Anyway, he ended up using the tug to gently push the back of Mystic Moon into the mooring that he had just vacated. This is the first and last time I hope that a tug will have anything to do with my boat. But with my record of increasing mishaps, one never knows. So I am now waiting for Tom from River and Canal Rescue to appear tomorrow morning to mend whatever needs to be mended so the tunnel light goes on, and I can return to pressing a button that will turn my engine off exactly when I want it to. But more important, I know what to do if the button to turn off the engine doesn’t work again. ← A Marathon Journey and a whole load of friends to help along the way.